My wife occasionally reminds me that my relationship with tools is outside the bell curve of normal. The following thoughts may be proof of this. With some tools there is a learning curve. You have to figure them out before you get consistent results. I think of my Veritas plow plane this way. It wasn't immediately intuitive to a dummy like me and I had to learn her idiosyncrasies (and get an upgraded depth stop from the company) before I was happy. This isn't a deal breaker in my world, I'm happy to get to know a tool well if we're going to have a long term relationship. Many of my planes and I have had this courtship. Occasionally tools spring into your hand ready to go. Often it's because I payed my dues with a similar tool before finding this one. I taught myself good sawing technique on a self sharpened old Disston backsaw with a slightly warped plate. So when my first Bad Axe Saw found it's way home it was amazing. But there are a small percentage of tools that signify a paradigm shift in my shop techniques. They change the way I solve problems and even view my work in the shop. Around a year ago this Morakniv 120 arrived in the mail. I bought it to add to my spoon carving kit, but it didn't live in that tool roll for long. 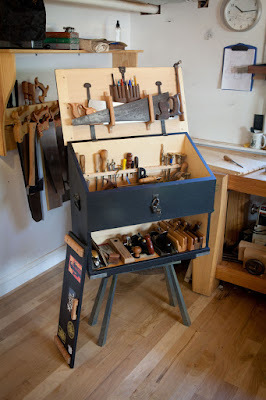 It doesn't even go in my tool chest, it hangs on one of the pegs over my workbench and other than my holdfasts and bench mallet, is the most quickly accessible tool in my shop. 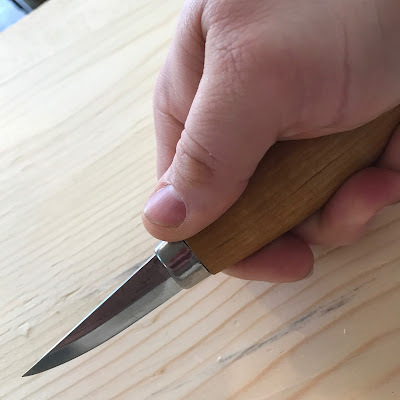 Last fall as I was building a set of kerfing planes and it became time to shape the handle, I decided to rough out the grip with the knife before reaching for the rasps, but once I worked down to a point I came to really like the lightly faceted feel on the knife carved handle. It transfered that "touch" to the tool's feel that's so elusive. So I slowed a bit and made better, finer, smoothing cuts to finish by knofe only. Treating the handles as I might the handle of a spoon. This knife simply answers the call of duty every time without complaint. It came to me very sharp and it holds it's edge for a long time and is still easy to maintain with a charged leather strop. The wooden handle is modifiable but honestly I found it comfortable and responsive out of the box. The only thing I don't like, that keeps me from strapping it to my belt, is the plastic sheath. 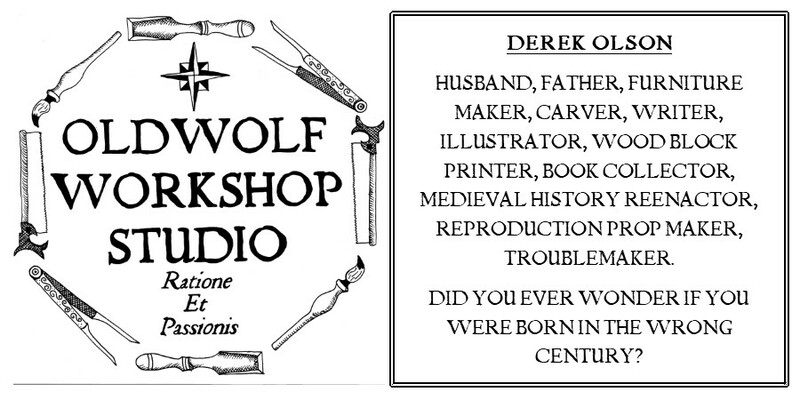 I suppose I should just find someone to make one for me out of leather. All in due time I suppose. So there you go. Even the simplest of tools can be transformative to your shop time when they are designed and crafted just right. This love letter is unsolicited and unsupported. 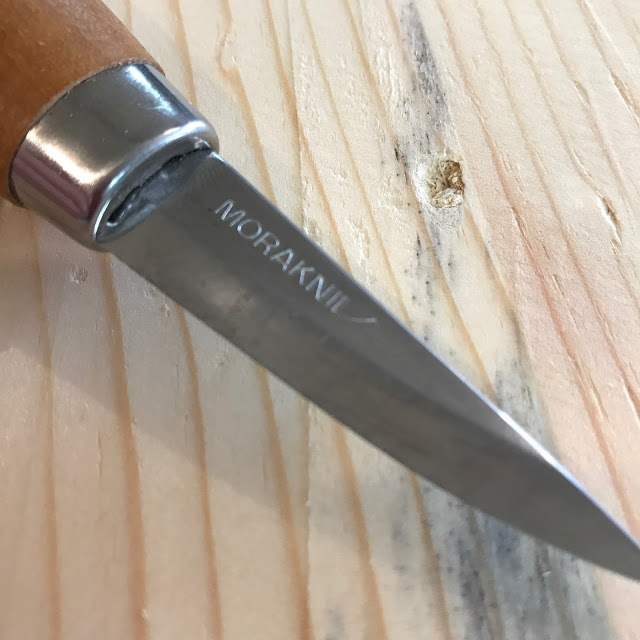 I was not asked by MoraKniv to write this nor have I recieved anything from them. I was using this knife in my shop this week and this post formulated in the joy of the shavings coming off the blade. I fell in love with my little Mora a few weeks ago. Best $20 I’ve ever spent on a tool.